A year ago today Hurricane Sandy hit Long Island. Obviously it hit New Jersey and New York City as well, but I feel like the damage on Long Island was just sort of swept under the radar. We were hit hard. And a simple three hundred and sixty five days later, we have proven why Long Island is really Strong Island. Everyone has this stereotype of Long Islanders. We’re obnoxious, we say “Lawn-guy-land,” we’re loud, we think our poo doesn’t stink…. the list goes on for days. But most people fail to see the strength it takes to be a Long Islander. It’s true, I’m a bit ethnocentric, but I don’t think we get enough credit. When Sandy hit we proved our strength. It was so horrible to see towns flooded, houses ruined, items lost; but what a way to restore humanity when seeing people come together and help one another, even in the smallest of ways. Luckily my house was fine, there was a tree that fell in the backyard right into the pool, which led to my dad getting poison ivy, but that was the brunt of our damage. However, the whole no electricity for five days was one of the most horrific experiences thus far in my life. I know what you’re thinking, “What a spoiled little brat!” But really, I can assure you even though I’m disgustingly dependent on electricity (which I realized through all of this), it was a difficult thing for everyone. Besides not having heat for those five days, you had no idea about what was going on. We couldn’t see the news that people all over the rest of the country were seeing. And listening to the radio can only provide you with so much of an insight. The worst part though was the feeling of extreme depression that was so evident in every Long Islander’s eyes. When were the lights going to go back on? Is this going to ruin business? Is (insert family or friend name here) okay? How are we going to rebuild? In all seriousness, it was overwhelming, and just plain scary. But now here we are, a year later, and we have rebuilt. Most people are back on their feet again, or at the very least on one foot with the other one a few inches from the ground. We rebuilt as a community. No one was truly alone. Long Islanders don’t get enough credit, but we are full of such crazy strong people, who somehow all are able to unite in times of a crisis simply because we basically all share the same accent. That’s pretty cool when you stop to think about it. 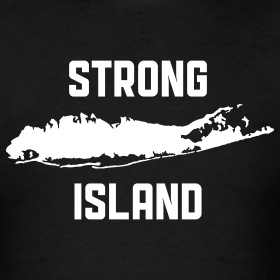 So, if ever anyone feels the need to badmouth Long Islanders, we Strong Islanders will gladly vote you off this Island. We are intrepid Strong Island, we carry on. To those who had to deal with an insane amount of damage from Hurricane Sandy, I hope you can look back at your progress over the past year and realize that by picking up even the smallest pieces, you have actually made strides. God bless.